JLL is happy to introduce one of the latest models on Yoga and Pilates mats. 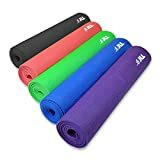 They come in a variety of colors and provides soft cushioning to protect knees and bottoms from hard floor below during sit ups, Pilates and yoga exercise. The Yoga and Pilates Mat has a closed-cell surface which will prevent perspiration from seeping into the mat and breeding bacteria. The textured grip will help even out the surface you are using and prevent any crease sometimes experiences from other mats.